Plants vs Zombies 2 received a new update this week. Finally, the new world is accessible, and it takes us to the Middle Age, in an expansion called Dark Ages. If you know the game, you will be eager to unlock the new world and start this medieval crusade. If you do not know it, you are missing one of the best games of “Tower defense” style for mobile devices. In previous updates, we had access to the future world, something long awaited among fans. When that interesting world unlocked, a new one appeared, with a silhouette that reminds us of medieval castles. Finally, the world has just unlocked this week, and as the silhouette suggested, it is a medieval world named Dark Ages. As in the previous ones, we have new zombies characterized according to the time, as well as new plants to deal with them. As the name suggests, the zombies will attack us under the moon light, so we need alternative methods to obtain suns. And the help will come to us in the form of mushrooms. In this new update, we recover the mushrooms from the first part, both to generate suns and to throw poisonous spores, plus the entire collection of different kinds of mushrooms that we already knew. 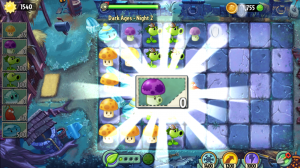 As we advanced through the levels, we will get more mushrooms, some of them totally original of this expansion, as the “Sun Bean”, which has the ability to infect a zombie to make it produce suns when taking damage. The new plants will help us deal with the zombies that are attacking us, some with new special abilities. These include the knight, covered in an armor that gives him an extreme strength, or the jester, able to deflect some kind of attacks. 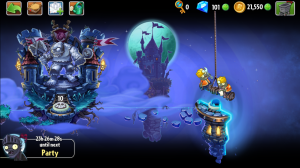 Dark Ages has only 10 levels, which makes it the shortest expansion PopCap has released to date. However, the outline of a new world appears behind this medieval setting, so a new expansion is coming. 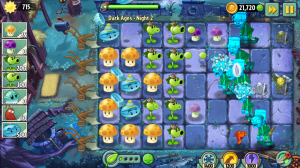 Plants vs. Zombies 2 remains completely free, but includes in-app purchases to obtain some improvements, unlock worlds or plants and accelerate the plants growth in the garden. Plants vs. Zombies 2 is available for iOS and Android devices, and you can download it completely free from the App Store and Google Play respectively.